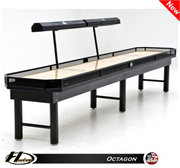 Hudson Octagon Shuffleboard Table: A contemporary design with a sleek black finish. Bring a contemporary, edgy feel to your game. The Octagon Shuffleboard Table is designed with a sleek black finish, mesh edging and overhead lights. The table has a 3-inch thick playing surface made from polymer-finished maple�the same type of finish that tournament players insist on. This shuffleboard table features a black aluminum cradle and solid wood skirt and legs. There are several sizes available, ranging from 9 feet for smaller sized rooms, to the regulation tournament size of 22 feet. All sizes include climatic adjusters to prevent warping of the play surface. Included with this unique table is everything necessary for your high-powered game. There�s a set of eight playing weights with a wood storage case, speed powder, adjustable leg levelers and a board wipe. A chalkboard scoreboard helps you keep the tally on the game during competition. Enjoy playing, whether recreational or competitive, just like the professionals.